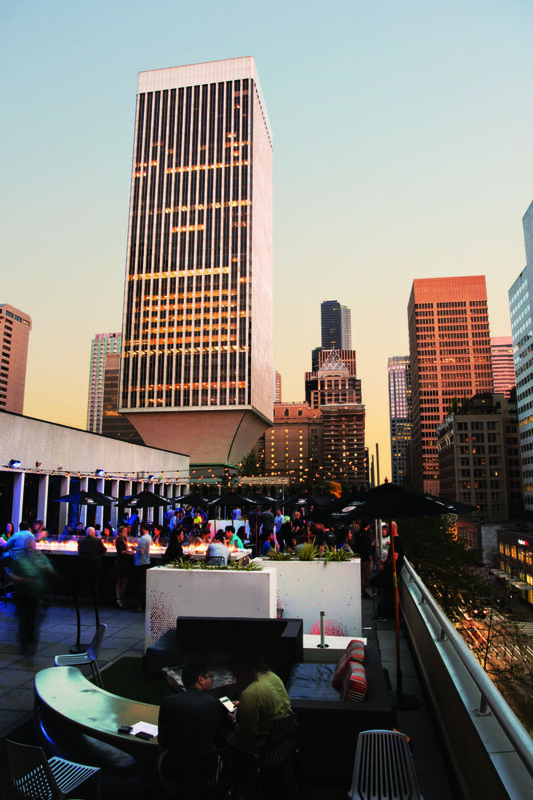 Take advantage of Seattle’s dazzling warm-weather months by gathering on a rooftop bar to drink in the sunshine. What better way, after all, to take in the city than with a cocktail in hand? On the west side of Capitol Hill, two restaurants provide delectable menus and impressive downtown views. Terra Plata’s (1501 Melrose Ave; terraplata.com) deck, a stately wooden mix of family-style tables and banquettes, is a perfect setting to enjoy the fresh seasonal dishes and house-made sangria. A couple blocks away, Mezcaleria Oaxaca (422 E Pine St; mezcaleriaoaxaca.com) offers Latin flair, with a cocktail menu full of smoky mezcal concoctions for warm nights under the stars. (615 19th Ave E; monsoonrestaurants.com) has its own rooftop dining area. The cozy setup encourages a more laid-back sipping experience, as does the deep cocktail menu. Enjoy a similarly relaxed feel on the two outdoor patios at Captain Blacks (129 Belmont Ave E; captainblacksseattle.com), a nautical-themed bar in Capitol Hill. In the heart of downtown, Motif Seattle’s bar, Frolik Kitchen + Cocktails (*1415 Fifth Ave; frolik.motifseattle.com), goes with an ultrachic lounge vibe. You can find a modern outdoor fireplace under a constellation of hanging lights, plus rooftop shuffleboard. Downtown’s Hard Rock Cafe (*116 Pike St; hardrock.com) is another one of the best rooftops in the city. The mix of covered and open-air couches and fire pits boast a unique view of Pike Place Market and its iconic sign. Located in the historic market, The Pink Door (1919 Post Alley; thepinkdoor.net) is another fantastic option, with a rooftop patio that has views of Elliott Bay. And proving that rooftop bars aren’t going anywhere, local chef Josh Henderson’s newly-opened rooftop bar The Nest (*110 Stewart St; thompsonhotels.com) sits atop the Thompson Seattle Hotel, starring views of Puget Sound and a focus on barrel-aged cocktails.